Diabetes is a chronic, incurable disease with many symptoms. 1.2 What are the Emergency Symptoms of Type 1 Diabetes? 1.3 How Can You Know If You Have Diabetes or Not? People who suffer from diabetes go to the bathroom to urinate more frequently and tend to spend most of the day rushing to the toilet. The cause of this is the big amount of glucose in the blood. When a person is diagnosed, the frequent urination may still remain present as one of the constant symptoms of type 1 diabetes. This may be a result of ineffective insulin or in cases where patients refuse or forget to use insulin. When this happens, the kidneys are unable to filter the glucose into the blood and take water from the blood in order to do this. This will, in turn, fill up the bladder of the patient and cause frequent urination. People who urinate more often lose plenty of liquid from the body. Therefore, they have the constant need to hydrate and are drinking more than usual. If you are finding yourself to be thirsty the majority of the time, this may be one of the signs of type 1 diabetes. When the insulin in the body stops working properly or completely, the cells no longer have their main source of energy. In these cases, the body reacts by trying to gain more energy, which of course can be done trough food. People with failed pancreas are very likely to experience intense hunger. Diabetics eat more as a result of the lack of insulin and energy in the body, therefore they are more likely to gain some extra weight. This symptom of diabetes type 1 is more common in patients than the one with weight gain. The body lacks in insulin, so it is normal for it to seek out other energy sources. The result is the body breaking down muscle tissue and fat in order to get more energy. Weight loss is a more common in patients with type 1 diabetes, than in type 2 diabetes. The reason for this lies in the sudden onset of this particular disease, while type 2 diabetes is known to be a more gradual disease. When the insulin levels are too low or non-existent, the glucose is not providing the cells with energy. This can often make a person feel tired and cause increased fatigue. Tissue being pulled from the eye lenses can cause blurred vision and this can greatly affect the eye focus. When this happens, the diabetes patient is recommended treatment in order to fix it. In some severe cases, the eyes do not solely lose the ability to focus, but blindness or prolonged vision may occur too. When this happens, seek medical help immediately. Experiencing fatigue and extreme thirst and hunger can make a person anxious and irritable. This is why diabetes 1 patients often feel nervousness as one of the most common type 1 diabetes symptoms. The low level of glucose in the body can undermine the body’s ability to heal. This is why type 1 diabetes patients find bruises and cuts to not heal properly, or quickly. Another one of the common symptoms of type 1 diabetes is the feeling of itchiness. The increased amounts of sugar in the body reduce the person’s ability to recover from infections. Therefore, diabetes patients are exposed to more skin and yeast infections that are not healing fast. Women diagnosed with diabetes will find it really difficult to recover from vaginal or bladder infections. If you are suffering from diabetes, chances are you will experience more frequent gum infections and diseases. The gums in diabetes patients may become red, swollen and tender. If your gums pull away as one of the symptoms of diabetes type 1, the teeth may become loose. Men over the age of 50 can experience sexual dysfunction as a result of diabetes. This can be either constant or frequent erectile dysfunction. These signs of type 1 diabetes occur most commonly in the feet and the hands of the patient. In cases where there is too much sugar in the body, the nerves of the patient can become damaged. Additionally, the blood vessels that usually feed these nerves can also be damaged and this may cause numbness and tingling in the hands or the feet. At the time of the first clinical presentation, the type 1 diabetes symptoms can be traced back. This may capture a period of days to weeks. However, the start of the beta-cell destruction does not always start at the same time with the onset of clinical symptoms. In some cases, it may start as early as years before the symptoms start to show. This chronic disease is characterized by sudden onset of symptoms. Patients with type 1 diabetes commonly present diabetic ketoacidosis, as a result of the stress of surgery or illness, or without any particular reason whatsoever. The body needs energy to function. When the pancreas fails partially or completely, it stops making insulin and the cells do not receive the energy they need. As a result, the patient may lose some weight and their body creates byproducts called acetone or ketones. This chemical is actually used in nail polish remover. When the ketones are created, the body reacts to this happening. The kidneys will recognize the poisonous chemicals in the body and try to flush them out of the body trough the urine. When this is impossible or the body fails to flush them completely, the ketones can build up in the blood. This causes the nausea and the stomach aches in type 1 diabetes patients. The name for this occurrence is diabetic ketoacidosis or DKA. Another symptom from diabetic kepacidosis is fruity, unnatural smell in the breath of the patient. This is also another way of the body to get rid of the harmful chemical inside. When the body attempts to get rid of the ketones, the breathing starts to be rapid and heavy. This breathing is referred to as Kussmaul breathing. If you notice that your child is showing these symptoms, it is recommended that you visit the doctor immediately. What are the Emergency Symptoms of Type 1 Diabetes? The most serious level of type 1 diabetes is diabetic ketoacidosis and these are all signs of it. This condition can be life threatening if you do not seek medical help immediately. The number of patients diagnosed with this condition is big. Around 1 person in 4 diagnosed with type 1 diabetes is also diagnosed with ketoacidosis at the same time. These 6 symptoms must be recognized as soon as possible in order to get an early diagnosis before this disease really sets in. How Can You Know If You Have Diabetes or Not? The majority of people are completely unaware that they suffer from type 1 diabetes, especially when the disease is in its early stages. This is mostly because the symptoms may still be absent or be too mild to attract more attention. There is no definite way for a person to know if they are suffering from diabetes without visiting the doctor’s office. In order to be sure, a doctor must do a blood test in order to determine the patient’s glucose levels. So, if you are experiencing any of the abovementioned type 1 diabetes symptoms, you should seek medical help. The symptoms become more unpleasant as the diabetes worsens and are very difficult to avoid because of their rapid progression. However, if one decides to leave these symptoms untreated, this can lead to serious health problems such as diabetic ketoacidocis. This in term, can result in coma that in the end, may even be fatal for the patient. Type 2 diabetes is much easier to miss than type 1 diabetes. The reason for this is that this diabetes type develops more slowly and it is almost impossible to spot the symptoms in the early stage. Aside from the diabetic kotoacidosis, there are also other negative effects of ignoring the diabetes. The effects can be seen in many of the major organs such as the blood vessels, heart, nerves, kidney and even the eyes. An early diagnosis and proper treatment can go a long way. If you have a friend or family member that suffers from this chronic disease, you need to watch them carefully for any drastic changes. These may all be symptoms of the disease. After all, diabetes is not an easy thing to live with and our closest need all the support they can get. This is especially the case with parents whose kids are diagnosed with type 1 diabetes. Kids are less likely to be too responsible or able to notice all the symptoms of this disease. This is why it is highly important for every parent to keep close watch on their kids, in order to treat and prevent type 1 diabetes symptoms. Diabetes makes it impossible for the body to function properly and can be seriously threatening if not diagnosed in time or treated properly. 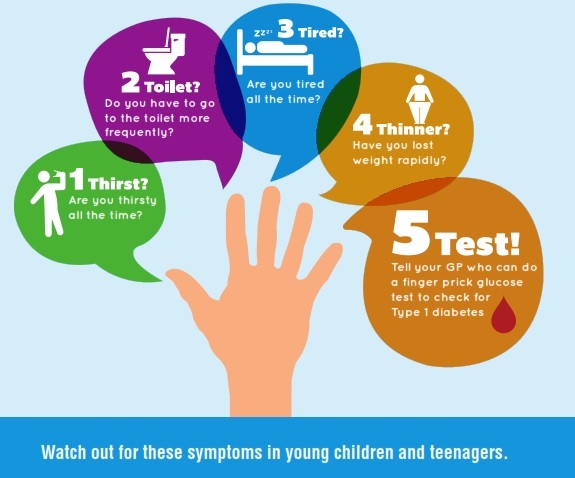 This is why it is highly important that you visit the doctor’s office immediately if you are experiencing some of the most common symptoms of type 1 diabetes.